The idea for this bread came to me as I was continuing my spring cleaning of the kitchen cabinets and encountered a half-full container of organic dried apples I had bought a couple of months ago at the farmers’ market on 47th street. I had some fresh apples as well which I needed to do away with before our trip. I also had some newly bought muesli that I was eager to try. I remembered reading in Joe Ortiz’s The Village Baker that he made a bread with an apple starter and another one with some muesli mash. I didn’t have time to make a foolproof apple starter (although I definitely will later on this summer or this fall because I love the idea) but I thought, hey, why not try to just ferment an apple with some sugar and water and see what happens? If it didn’t turn out to be palatable, nothing much would be lost except the apple. As for the muesli mash, it is very easy to make. Just soak the muesli with hot water overnight, in the morning add the flour and the sweetener (inspired by Jeremy from Stir the Pots, I used pomegranate molasses instead of honey) and let it rest between 24 and 36 hours. But everything hung on the fate of the fermented apples. Would they make the bread or the compost heap? On the day of the baking, when I woke up, I still didn’t know. I uncovered the bowl and hesitantly took a tiny bite out of a tiny piece and…the flavor was incredible, both sweet and alcoholic and very, very sophisticated. The juice that had seeped out was marvelous in its own right. It went straight into the dough. Imagine fall concentrated into an elixir and you’ll have an idea of what it tasted like. I bet fermented apple pieces would be delicious in sourdough pancakes. That will be for when we come back! Meanwhile, hesitation was no longer possible, the bread was begging to be made. I knew I wanted a healthy dose of whole wheat flour and I also wanted a very wet dough as the dried apples might soak up all the moisture otherwise and I would end up with an autumn-tasting brick. So here is the recipe I came up with. I added a tiny bit of honey. For consistency sake, I should have stuck to the pomegranate molasses but, still under the spell of the magical potion, I completely forgot that it had been my sweetener of choice for the muesli mash. Ah well, not to worry! Pomegranate molasses being quite acidic, maybe honey was a better choice anyway, especially because I had forgotten to feed my starter the day before and it was definitely giving me sour looks. When I wrote the above post, we hadn’t yet tasted the bread. Now we have and we love it. 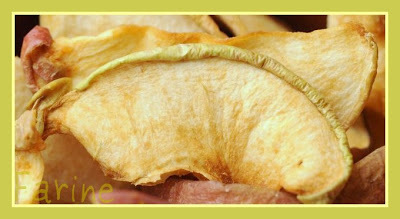 It has a crunchy crust and a flavorful crumb and the pieces of apple are a real treat. The interior could be a bit more open but I am not sure how to go about getting more holes with as much whole wheat. I’ll have to experiment. As always, suggestions are welcome! Set to cool on a rack. This Double Apple Bread goes to Susan, from Wild Yeast, for Yeastpotting. 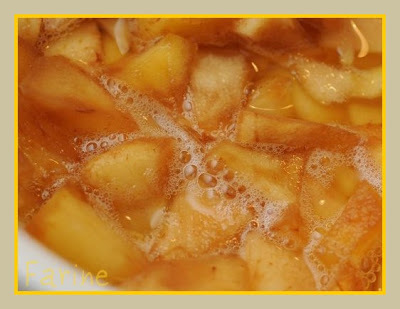 I am goind to try baking this apple bread–only need to buy same fresh apples–and I am ready. You*re such a creative !!! Thanks for the new temtation,this bread just **killed**:) me this morning. What a unique and beautiful bread! When I lived in New England and we could get real, fresh sweet cider (which is very difficult to find here) I loved leaving it in the refrigerator until it was what some would call "past its prime" but what I thought was perfect — and just as you describe your fermented apples, sweet and alcoholic and sphisticated. So I am vividly imagining those apples now, and plotting the bread. Thank you! Looks great, I did the Ortiz bread once, and it does work. Though most of his recipes from his book I did attempt were a bit troublesome, and I think that can be said for a lot of other bread books from bakers that were out on the shelves along time back; editors weren't so keen on making bread then selling a book I think? I think that bread needs some good sheep cheese with it!!! Dear MC, your double apple bread is gorgeous! What a great idea! I love the look of the fermented apples after 5 days. 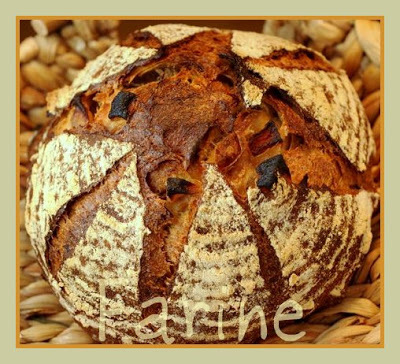 I will definitely try your idea and make it a Triple Apple Sourdough (with apple puree as well). 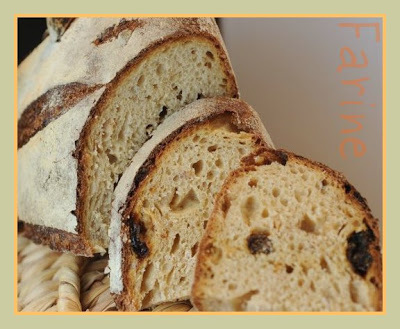 Thanks for sharing this fabulous bread and have a great trip in France. Hi, Jeremy, you are right, a sheep cheese would be awesome with it, although not the Roquefort kind. Now that you mention it, I remember making an apple bread ages ago. I wonder if it was from the Ortiz book. I don't remember much about it, except that I had certainly used yeast (active dry yeast at that time)and maybe too much of it because, novice baker that I was then, I set the dough to ferment in a big tightly sealed dough bucket (the type King Arthur sells) and we went sightseeing for the day with my parents who were visiting and when we came back, filaments of dough were hanging from the ceiling and there were splotches on the walls, the windows, everywhere! The dough must have literally exploded out of the bucket. That was a huge mess and come to think of it, the reason I don't remember much about that bread is that I never got to make it! Shiao-Pin, thank you! You know what? I almost made it a Triple Apple Bread as well but at the last minute, since I was going to put in a lot of water, I decided to try it first without the puree. So I'll be very interested to see how it turns out. Are you planning on using whole wheat too? I agree that we don't do enough with "fermented" foods! Glad to see you are adventurous with it – I once picked some collards from my garden, and put them in a 5 gallon bucket to wash them – then I forgot them for five days! When I next saw them, they were evervescent – I was going to pitch them, but decided to at least try them first – they were a taste sensation! Now I do it on purpose. Hi, John, thanks for visiting. I'll have to try and forget some collards in a 5-gallon bucket of water someday as I can't imagine how they turned out. A bit like sauerkraut? What a wonderful and fabulous bread you have here! Nice job! This is truly a beautiful bread. Seems like a really sharp cheddar would be awesome with it. Can I ask the hydration of this? If my math is right, I got 71'ish percent. I'm still working on the baker's percentage thing. Thanks! Thanks to you I have now made my Triple Apple Custard Sourdough(http://www.thefreshloaf.com/node/12626/triple-apple-custard-sourdough). I added custard into the dough as I really love the combination of apples and custard. Thanks so much again for the great idea! Have a great vacation in France! 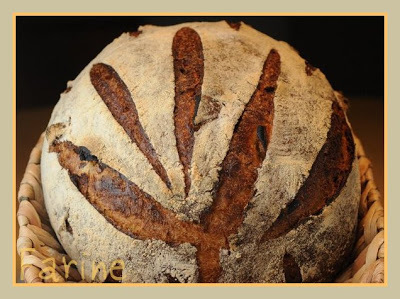 Oh Farine this bread looks amazing. I have bookmarked this recipe for when I have a week home to spend the time making it.